(a) This system uses ultrasonic sensors to detect any obstacles at the corners and the rear of the vehicle. The system then informs the driver of the distance between the sensors and an obstacle as well as their positions by indicating them on the multi-information display (in the accessory meter assembly) and by sounding a buzzer. Engine switch is on (IG). Clearance sonar main switch is on. Shift lever is in any position other than P.
Vehicle speed is less than approximately 9 km/h (5.6 mph). The sensors stop operating when the vehicle speed exceeds approximately 13 km/h (8.1 mph), and start operating when the vehicle speed drops below approximately 9 km/h (5.6 mph). (1) When the initial check is operating (the engine switch is on (IG) and the clearance sonar main switch is on), the clearance warning ECU assembly provides power to the first sensors in each series (front left sensor and rear left sensor). (2) After the power is supplied, the front left sensor and rear left sensor enter standby mode to receive an ID from the ECU. When a certain amount of time has elapsed, the ECU sends an ID allocation signal to these sensors. (3) The front left sensor and rear left sensor receive the ID allocation signal from the ECU and perform self-diagnosis. 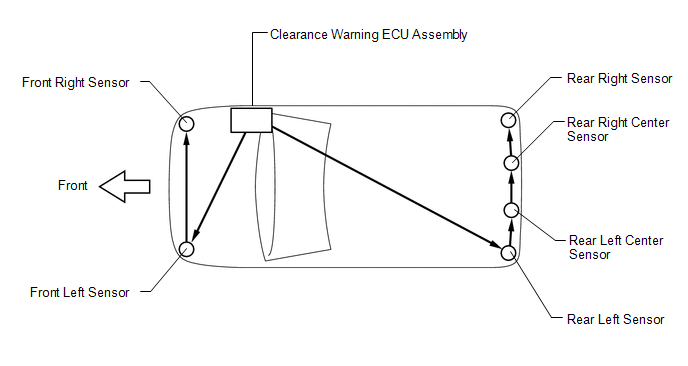 When the sensor self-diagnosis is completed, the ECU sends an ID allocation confirmation signal to these sensors. (4) After the ID allocation confirmation is performed, the ECU provides power to the second sensors in each series (front right sensor and rear left center sensor) via the first sensors. In the same manner as the first sensors, the second sensors enter standby mode. When a certain amount of time has elapsed, the ECU sends an ID allocation signal to the second sensors. (5) The above operation will be repeated until an ID is allocated to the last sensor, which is in the rear series (rear right sensor). Initialization ends when ID allocation to all ultrasonic sensors is completed.